Any casual reader of this blog will note that I don't really find any value in the myriad of management practices that have been added to medicine since businessmen and their friends in government have taken over. The only reasons that these practices have been added is strictly political and rhetorical. Nothing has been overhyped as much as management adding value to medicine with so few results. Nothing has done quite as much to detract from the quality of care than these same business practices. At this point they have become as entrenched as gun legislation and will be every bit as intractable. These problems are very difficult for the typical consumer/patient to see. The obvious points of contention are insurance company denials either for medication or medical care. They peaked in the 1990s when managed care companies thought that they would just put specialists out of business and had primary care physicians acting as "gatekeepers". If you are old enough you may recall having to get a referral from your primary care physician to see specialists, for various services. and in some cases even to go into an emergency department. It took them a while but these businesses learned that being that transparent in denying care was probably not in their best interest. It also created a large burden on primary care physicians who were now uncompensated reviewers for the insurance company business practcies. Eventually that system was scrapped in favor of shifting financial risk around - some to consumers and some to physicians and physician groups. There are many ways it can happen, I thought I would provide a few examples below. Managers like to use a shared decision making model in their manipulation of physicians. I guess they don't consider physicians to be particularly bright people. I don't know if that happens when you are socialized in the business world and automatically consider your decisions to be the best based on scant data, a lack of measurement standards and perceived quality of a good idea. Whatever the reason, the approach generally only works because the physicians have no leverage. Consider the following example. Ten physicians are in a group providing hospital coverage for admissions to a community hospital. It can be any specialty. They are working a 7 days on and 7 days off model and each of them typically admits 10-14 patients per day at work. They are stretched to the maximum so that anyone requiring emergency leave seriously disrupts the schedule. Their colleagues are expected to cover. The administration would like to open an 10% additional bed capacity and meets with all of the physicians about this to problem solve over how that might happen. The physicians are asked the question: "We are here to all figure out how to increase the number of admissions by 10%. Do you have any ideas about that?" That leads to a general discussion of how the physicians are overworked and already spending too much time from home on the electronic health record. A consensus builds and the physicians say they need more staff and staff to cover unpredicted absences. At that point the administrator states: "No - I guess I didn't explain myself very well. We are here to decide how to provide more services without increasing the cost by hiring new people." The physicians finally get it. Sharing in this case means, I will ask you for your input, but it is meaningless and I will require that you work harder even though you are probably burned out right now. Another popular sharing model where physicians share more than anybody else is financial risk sharing. The first introduction was when RVU productivity units were introduced. The initial administrative argument seemed to be that not everyone was carrying their own weight. The RVU system was portrayed as being inherently more advantageous to those people who were really productive. It would allow them to make more more than the slackers in the department. That was a good theory to try to appeal to physicians competitive natures, but in most departments - schedules and productivity was already saturated. There were no slackers. That point goes to the administrators. The second risk sharing introduced was the "holdback" model. This said that 10-15% of everyones' productivity would be held back until it could be assured that the production figures were met and then it would be released to the physicians in the group. Keep in mind this was money that was already billed and earned. There was no similar "holdback" from administrators or other personnel. A take off on this risk sharing was getting physicians in administrative meetings and showing them endless spreadsheets of overhead costs and how much they would have to "produce" in order to get either their holdback or some other form of reimbursement. The ultimate form of risk sharing today seems to be the contract that comes in and puts everyone at risk by not even recognizing the physician billing. In this case the insurer comes in and says - this is how much we will pay you on a per diem basis to cover these patients for various problems. You agree not to charge use anymore than than - no matter how much care each one of those patients needs. This last model is the most insidious. It caps any insurance payments (losses) and puts any physicians and their clinic at complete risk for catastrophic loss but more importantly it is a war of attrition. With this model as the only source of funding, it allows administrators to view physicians as "costs" rather than resources and eliminate them, underfund them, overwork them, and burn them out. It is a tried and true pathway for how managed care organizations using this model can adversely impact the quality of care in every organization they contract with, but especially the ones that don't understand corporate doublespeak. Not what somebody forced us to believe for a few months at a time while they were wasting our time, energy, and money. The American Medical Association came out two days ago and said that they were dropping the pain as the fifth vital sign movement because it encouraged opioid overprescribing. Even more interesting is that I did not get the news from the AMA (I am a 30 year member) but from the Pain News Network. The only stories that I could Google the next day was about the AMA defending its position against attacks from pain societies and organizations who want to maintain what I would describe as a liberal approach to opioid prescribing as the best way to approach pain. My term liberal is meant to connote a political position with no basis in science and the lack of science started in 1998 with the pain as a 5th vital sign approach. In 1996, the President of the American Pain Society declared pain as the Fifth Vital Sign. 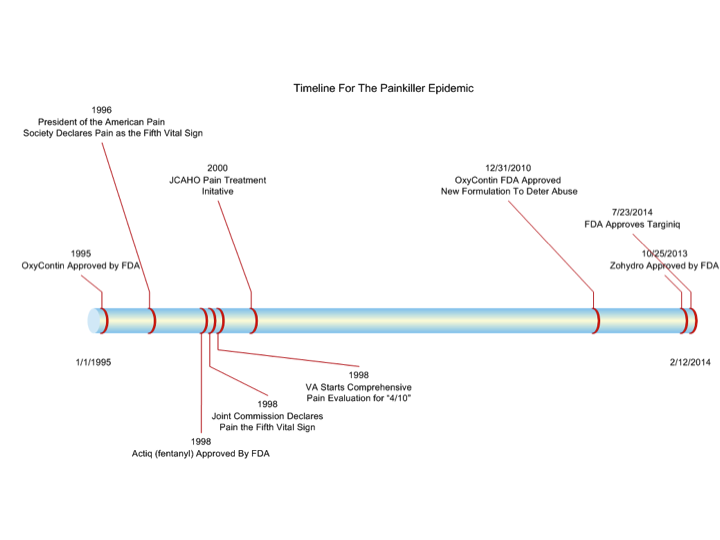 In the year 2000, the Joint Commission (then JCAHO) launched a pain initiative that described the 10 point pain scale as a "quantitative approach to pain." I don't know if quantitative analysis is still a prerequisite for medical school, but this is a reason why it still should be. In quantitative analysis, the task is to measure chemical concentrations accurately and reproducibly. To use a quote from my old analytical chemistry text (1): "Qualitative analysis is concerned with what is present, quantitative analysis with how much is present." The ability to do this is often a major part of the grade for that course. Since the chemical composition in the samples are known - they should be determinable with precision. In some cases, a lack of accuracy can reflect problems with the analytical technique if there are widespread variations in the results. This is a true quantitative approach. 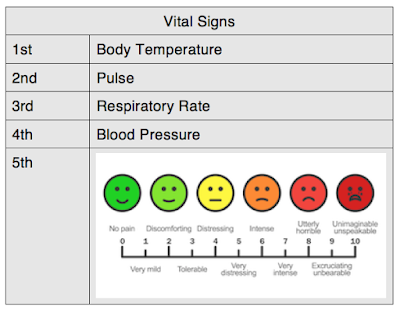 Asking a person to rate their pain on a 10-point scale is not. Pain is a subjective experience influenced by a number of variables including whether the pain is acute or chronic, emotional state, the presence of an addiction, and personal biology affecting pain perception. It is not a quantitative assessment. It is as obvious as asking someone where they are on the 10-point scale and being told they are a "14". There are a lot of potential messages with that statement, but none of them involve an accurate measurement of pain. A quantitative scale has no implicit meaning - it is supposed to be a known measurable quantity no matter what. From a medical perspective, there is also no better example of the adverse consequences of widespread screening for a problem. Chronic pain varies with age and other demographic factors. Epidemiological surveys show widely variable numbers of people with chronic pain, but some suggest an average is about 25% of the population and 10% of the population with pain that has some secondary disability. While there are no good ways to estimate the optimal amount of opioid needed to treat pain in a population, current data suggests that the US is the largest consumer of prescription opioid drugs in the world. For example, the US has 5% of the world's population and Americans use 55% of the world's supply morphine and 37% of the world supply of fentanyl. By contrast 80% of the world population uses 9.9% of the morphine and 19.7% of the world's fentanyl. The United States is clearly at the top in terms of opioid consumption. Clinical trials have also shown that opioids are moderately effective for some forms of chronic pain and no more effective than non-opioid medications. The screening approach to chronic pain is clearly associated with overexposure to opioids, widespread availability of illicit sources of opioids, and an epidemic of overdose deaths. The idea that rapid assessments can be made with rapid qualitative screening by anyone also eliminated pain specialists as gatekeepers in the decisions about who would receive treatment with opioids for chronic noncancer pain. In the opening days since the AMA statement, it appears that political forces are lining up to maintain the status quo. The idea that the AMA has to defend their position seems like pure rhetoric to me. How about the American Pain Society defending the original statement in the context of everything that has happened since? Despite defensive statements about how opioid prescribing was increasing before the position was adopted - the hard data suggests that it was associated with a major inflection point in opioid consumption in the USA. The policy debate on this simple statement has far reaching effects for health policy in the United States. At every level in today's health care system there are groups of managers/administrators who have set themselves up to monitor various measurements and hold somebody accountable. I doubt that they know the difference between quantitative or qualitative measurements any more than the people who proposed that a subjective pain scale was somehow a quantitative measure. I doubt that any one of them ever took a class in Quantitative Analytical Chemistry. 1: James S. Fritz and George H. Schenk. Quantitative Analytical Chemistry. Second Edition. Copyright 1969 by Allyn and Bacon, Boston, p 3. Pain scale graphic downloaded from Shutterstock per their standard license on June 29. 2016. JAMA Internal Medicine came out with an article this week that has been heavily covered by most media outlets. The Wall Street Journal headline was: "Even Cheap Meals Influence Doctor's Drug Prescriptions, Study Suggests". Time concludes: "Why Doctors and Drug Companies Can't Be Friends". Even public radio got into the act with "Crestor Prescriptions Rise After Doctors Get Free Meals." It is pretty clear that in the court of public media that Big Pharma is at it again, bribing doctors into using their drugs and the most expensive drugs at that. But is that really what the article suggests? "Our data are cross-sectional. The findings reflect an association, and not necessarily causality. Because we linked 5 months of Open Payments data with 1 year of Medicare Part D prescription data, we also could not determine whether high prescription rates for brand-name drugs were preceded, followed, or temporally unrelated to the receipt of industry-sponsored meals. The policy implications of our findings thus depend on further clarification of the mechanism of the association between the receipt of industry-sponsored meals and physician prescribing behavior..."
Two additional paragraphs of study limitations follow that clearly show that this initial look at this data has significant limitations. Various blogs and sites have picked up on this paper as well many of the physician sites also seem to favor the narrow interpretation as seen in the press. In some cases there is a nod to the theoretical issue of causality but a discussion of the result as though it is proof of something. I can think of a number of competing theories that should be tested instead of the meal equals causality theory but do we even have to go there? Bear with me on the analysis here. Looking at the basic design of this study, the authors looked at a database of 533, 919 prescribers in the Medicare Part D database. 252,250 of these prescribers were eliminated for administrative reasons that can be examined in the Supplemental section of this paper. From there the authors determined which of these physicians wrote 20 more more prescriptions for the four study drugs of interest - statins, cardioselective beta blockers, ACEI or ARB antihypertensive prescriptions, or SSRI or SNRI antidepressant prescriptions. Table 2 in the final paper shows the total prescribers and their characteristics in each group. The total number of physicians receiving financial reimbursement varies from 2-12%. That reimbursement totaled 63,524 payments totaling $1.4 million - 95% of which was meals and 5% in the form of other promotions. The meals averaged $12-18. The authors proceed to show that the sample selected for reimbursement were more likely to prescribe the promoted drug. They do this by calculating the odds ratio of prescribing versus the non-reimbursed physicians. They also calculate the odds ratio across a number of variables including the number of day (0 -> 4+) in order to demonstrate a dose response effect of the promotions on prescribing and conclude that industry sponsored meals was associated with an increased rate of prescribing the name brand drug in each class that is being promoted. The standard response to this study seems to be: "Aha - no news there. We knew that Big Pharma corrupts physicians and even the slightest gift sways prescribing practices." I will let the reader pull up the article and read the authors concerns about causality. I don't think that predictable corruption or an esoteric statistical argument about causality is the most interesting part of this paper. I think the most interesting part of this paper has apparently been lost on the majority of people reading it. Let me put it another way. Would it shock anyone that a small (2-12%) proportion of physicians, carefully selected for whether or not they accept promotions from pharmaceutical companies end up prescribing the promoted drugs more frequently than physicians who don't? I don't think that it should. The good news in this article is that 88-98% of the physicians studied apparently do not accept these promotions and by the authors definition do not prescribe the promoted drug at anywhere near the frequency of the studied group. The majority of physicians do prescribe promoted drugs, even without receiving any incentive from the pharmaceutical company and that should also not come as a shock to anyone. As a former member of two Pharmacy and Therapeutics (P&T) Committees, I can say unequivocally that all members of a generic class are not equivalent when applied to any population of human beings. Response and tolerability vary significantly from person to person. In the case of generic antidepressants - SSRI/SNRI are all commonly used as first line drugs primarily to avoid prior authorization harassment of the prescribing physician. There are many patients who fail several and many patients who cannot tolerate any of these medications. In those cases non-generic medications are often the next choices. Any time I see a statistic like an odds ratio, I tend to interpret it like percentages. Those numbers seldom stand on their own. There needs to be some additional data. In the table below, I show the number of prescribers in each category across all 4 classes of research drugs and the Target Drug used to calculate the odds rations. It is clear that the vast number of prescribers in each class are in the No Meal (NM) category. It is also clear that the prescribers in the Meal (M) category prescribe the drug class at a much higher rate than their NM colleagues. Even if the prescribing rates in the M category are relatively high, it is easy to speculate that the total prescriptions for the target drugs may actually be higher in the NM category despite the odds ratios indicating that the M physicians are more likely to prescribe them. I sent an e-mail to the corresponding author on this issue and asked for the raw data as rates of target drug prescribing in each group or the raw numbers for all of the target and non-target drug prescriptions in each class. I will post those results here if I receive them. Just looking at total prescriptions in any class the NM physicians prescribe roughly 5 times the total of the 4 general classes of medications as those who are designated as M prescribers. Pharmaceutical companies are clearly selling these medications without the suggested promotion. This is a better measure of the impact of pharmaceutical promotions and it illustrates the fact that there are other significant forces at play than a free lunch. Overall I thought this paper was useful because it provided confirmation of one of my previous observations on pharmaceutical pricing. In that post I made the statement that even when physicians are taken out of the promotion loop by one force or another, the United States still has by far the most expensive pharmaceuticals. This paper provides proof that the vast majority of physicians are not getting the free lunch promotions and contrary to most of the headlines don't base their prescribing on an inexpensive meal. Although we currently do not have a good characterization of what the real difference in target drug prescriptions is between N/NM groups it is safe to say that there is more at play here than an $18-20 meal. That fact alone suggests causation is more complex than it seems in the papers. 1: DeJong C, Aguilar T, Tseng CW, Lin GA, Boscardin WJ, Dudley RA. Pharmaceutical Industry-Sponsored Meals and Physician Prescribing Patterns for Medicare Beneficiaries. JAMA Intern Med. 2016 Jun 20. doi: 10.1001/jamainternmed.2016.2765. [Epub ahead of print] PubMed PMID: 27322350. (free full text online). By Miansari66 (Own work) [CC0], via Wikimedia Commons. It is always an interesting phenomenon to see the headline grabbing news about how toxic psychiatric medications are killing people. At first it was just cult news, but these days it seems that some people can make a fairly good living at it. A knowledge of psychiatry or clinical experience is never a prerequisite. It always requires the reader to suspend their sense of reality and what they know happens in real life. That reality is that a family member, neighbor, or friend was having some very serious problems - saw a psychiatrist and got better. It also requires a suspension of belief in the tremendous history of what happens with untreated psychotic disorders both in terms of morbidity and mortality. Finally it requires suspension of a belief in the usual regulatory mechanisms. If so many people were dying from treatment - it would be obvious and somebody would be held accountable. Every state has medical boards that basically solicit complaints against physicians. Surely any group of physicians prescribing an inordinately toxic medication would come to light. You have to suspend all of these realities of course because none of it has occurred. Despite those reality factors there are any number of antipsychiatrists or people claiming to be critics who are basically using the same rhetoric warning people about the toxicities and how many people are killed by these medications each year. Some of their estimates are astronomical and suggest a clear and biased agenda. Actual community surveillance reveals an accurate picture and the medications with the highest complication rates are easily recognized by any psychiatrist or primary care physician. That is not to say that the medications prescribed by psychiatrists are perfectly safe. As I just posted - no medical decision including one that involves taking a common medication is risk free. I spend a good deal - if not over half of my time warning people about side effects that will never happen, warning people about severe but rare side effects, managing side effects that do happen, and screening for potential side effects that might go unnoticed by the patient like electrocardiogram abnormalities or blood tests for a specific bodily systems. In 30 years of practice, I have diagnosed the most severe problems including serotonin syndrome, neuroleptic malignant syndrome, prolonged QTc interval, various degrees of heart block, arrhythmias, myocardial infarctions, strokes, drug-induced liver disease, agranulocytosis, diabetes mellitus, diabetes insipidus, hypo/hyperthyroidism and many other that were either caused by a medication or picked up as a result of my screening for a medical complication or pre-screening for safe use. But relative to primary care, the number of diagnoses in psychiatric practice for this reason is smaller. The most significant cause of mortality in psychiatric populations is cigarette smoke. The most significant number of medical conditions are pre-existing and if the psychiatric disorder is caused by an underlying medical condition - it is not common. All of the factors in the first two paragraphs led me to read an article on the epidemiology of antipsychotics, antidepressants, and benzodiazepines in a well determined population and the effects on mortality in the June American Journal of Psychiatry. The authors have a number of studies that appear to use a similar epidemiological approach. For this study they identified cohort participants from national health care registers of all people 17-65 living in Sweden in 2005. They identified anyone receiving health care for schizophrenia or psychosis (by ICD-10 codes) and anyone on disability for schizophrenia. They also determined all of the antipsychotics, antidepressants and benzodiazepines dispensed from 2006-2010. They were classified by Anatomical Therapeutic Chemical Codes (ATC codes). They calculated cumulative exposures using the WHO defined daily dose (DDD) methodology. The WHO web site has a search engine that will let you search for the defined daily dose of medications. Examples for antipsychotic medications would include 10 mg for olanzapine and 5 mg for risperidone. The researchers summed the follow up days minus any hospitalization days and divided this into the sum of the dispensed medication. That allowed the subjects with schizophrenia to be broken into four DDD groups: 1) no antipsychotics, antidepressants or benzodiazepines during the follow-up, 2) low dose - small or occasional medications (0-0.5 DDD/day), 3) moderate doses (0.5-1.5 DDD/day, inclusive), and 4) high doses (>1.5 DDD/day). Using the olanzapine example that would mean a dose range from 0 - >15 mg/day cross all 4 groups. 1. Any exposure to antipsychotics or antidepressants was associated with a lower rate of mortality (15-40% lower) compared to no use. 2. High exposure to benzodiazepines was associated with a 74% higher risk of death than no exposure. Benzodiazepine users had the highest mortality, highest risk of suicide, and more frequent visits to health care services. 3. In terms of cardiovascular mortality, only high dose antipsychotic use showed an equal mortality to no exposure to antipsychotics with low and moderate dose showing decreased mortality. 4. A sensitivity analysis of first episode patients showed that there was a decreased risk of mortality with exposure to low and moderate exposure to antipsychotics and increased mortality with exposure to moderate to high dose benzodiazepines. More striking is the fact that during the follow up period this was a cohort of 1,230 patients and 45 (4%) of them died. Most of the patients with first episode psychosis who I treated were otherwise healthy 20 year olds, illustrating the significance of this problem. This is an excellent study from a number of perspectives. It looks at well defined data across a population that is generally possible only in Scandinavian populations. By contrast studies done in the US typically look at either incomplete retail pharmacy data designed originally for pharmaceutical sales or detailed health interview data that is based entirely on self report using long and detailed questionnaires. The study uses WHO methodology suggested for pharmacoepidemiological research. The follow-up period is during a times when most atypical antipsychotic medications are widely available. These are the drugs that are suggested as a source of higher cardiovascular mortality in psychiatric patients. The authors findings are discussed in light of several other studies that show similar effects. The finding of this study will come as no surprise to acute care psychiatrists across the US. It is the reason why psychiatrists cover these settings despite the hardships involved. They know they are treating very difficult problems with very little assistance and that even in the absence of a continuum of care they can be successful. These psychiatrists are also aware of the medication toxicity and more importantly as this article points out - they can identify high risk patients and safely treat them. Despite the concerns about the metabolic effects of atypical antipsychotic medication there is an implication that other factors (like smoking) may be more significant in the development of cardiovascular disease (3). The risk of antidepressant and antipsychotic medication can be seen in an appropriate context in this study and that is lowering mortality rather than causing it. The study also provides very useful guidance on benzodiazepine use. In my opinion, benzodiazepines should be used only briefly for the treatment of catatonia and acute agitation in patients with psychotic disorders. They should not be used on a long terms basis. I agree with the authors' idea that tolerance is a problem. When dose escalation fails or results in withdrawal and panic attacks or protracted insomnia, the risk for impulsive behavior and increasing depression is much greater. More frequent primary care visits can also occur due to tolerance and the need for dose escalation and more discussions of appropriate use. Treating this population in the United States is problematic because at a certain point, people can be safely detoxified from benzodiazepines only in an inpatient unit, and those services are widely unavailable. This study is a blueprint for quality assurance projects using the same methodology on electronic health records (EHR) across the country. Every clinical population should be examined using the authors' techniques and followed for outcomes and active interventions. The reference provides an opportunity to see the realistic risk and benefits of treatment in people with high risk psychiatric illness. It also presents an opportunity to use this methodology to provide better treatment to people with the same illness and prescription profiles everywhere. Instead of using the EHR to catalogue useless full text information and track physicians, the authors methods can be used with much finer tracking of details like BMI, blood pressure, smoking status and other relevant lifestyle factors. Apart from the aspects of polypharmacy, the overall difference in mortality due to a diagnosis of a psychotic disorder needs to be addressed, and it needs the level of detail available in an EHR. Psychiatrists in major health plans using large databases could get active feedback in a very similar manner. The EHR could finally be used the way they advertised it a decade ago. 1: Tiihonen J, Mittendorfer-Rutz E, Torniainen M, Alexanderson K, Tanskanen A. Mortality and Cumulative Exposure to Antipsychotics, Antidepressants, and Benzodiazepines in Patients With Schizophrenia: An Observational Follow-Up Study. Am J Psychiatry. 2016 Jun 1;173(6):600-6. doi: 10.1176/appi.ajp.2015.15050618. Epub 2015 Dec 7. PubMed PMID: 26651392. 2: Robinson DG. Early Mortality Among People With Schizophrenia. Am J Psychiatry.2016 Jun 1;173(6):554-5. doi: 10.1176/appi.ajp.2016.16030334. PubMed PMID: 27245185. 3: Newcomer JW, Hennekens CH. Severe mental illness and risk of cardiovascular disease. JAMA. 2007 Oct 17;298(15):1794-6. PubMed PMID: 17940236. The assessment of potential for suicide is a large part of a psychiatrist's work. Within the past decade these footnotes have popped up even in algorithms that are designed to guide decisions about psychopharmacology. They have always been present in treatment guidelines for most major psychiatric disorders. They are a major cause of anxiety for practitioners, because we all know that our predictive capacity is low, but more importantly we know that unlike Internists and Surgeons we have limited access to the resources necessary to address the problem. Considering for a moment a typical outpatient crisis, for a person known in the practice with depression who is now clinically changed in an office assessment with suicidal thoughts, the options are very limited. In the case of an assessment of extreme risk, inpatient treatment may be offered. If the patient has any inpatient experience at all, he or she knows that inpatient units are generally miserable places where very little active care happens and where they are enclosed with a number of very ill patients. They may also know that there are an arbitrary number of hoops that must be jumped through in order to be discharged and that as a result they may be in that environment much longer than they need to be. They may also have had a typical experience of the inpatient psychiatrist not talking with their outpatient psychiatrist and making a number of abrupt medication changes that are neither necessary or indicated based on their brief familiarity with the case. For those reasons and also because most people are averse to sitting in hospitals - people will balk at the suggestion of inpatient care. The suggestion of inpatient care also assumes there is the availability of that option in the community. Most hospitals in any given state do not offer inpatient psychiatric care. That level of care has been discriminated against at a political and financial level for 30 years and as a result hospital services and inpatient psychiatric beds have contracted in an expected manner. Patients are often transferred hundreds of miles within states to reach these beds. A related issue is the availability of electroconvulsive therapy (ECT) for severe depressions. In the case of high risk depression it may be the only effective option. Many states have no availability of this option for patients who need it. The suggestion of emergency department (ED) care is an even bigger dead end. The vast majority of ED care is provided by mental health professionals who are not psychiatrists and who are making triage decisions that ED physicians can sign off on. The wait is hours and if a high risk determination is made it might be days in the ED before any disposition can be made. Patients are often discharged on the basis of whether their suicidal ideation is chronic or not and whether they are saying that they have a suicidal thought and an intent to harm themselves right at the time of the assessment. All of the above factors generally place the burden of care back on the original treating psychiatrist, even when the risk is higher that he or she would want. Most psychiatrists recognize that if they are treating very ill patients, there needs to be an element of acceptable risk in order to provide treatment and the hope of recovery. Psychiatrists realize that resources are severely rationed, that their patient needs acute treatment, that the patient will only accept certain treatment, and that there is a societal expectation of medical paternalism if the patient in not able to remain safe. The psychiatrist and the patient are frequently operating in this zone of acceptable risk that is perceived very differently by others. Family members are the clearest case in point. Like society in general, many family members have their biases when it comes to psychiatry. Many have been instrumental in discouraging their family member from getting treatment. In some cases they have interfered with treatment and suggested that the family member discontinue treatment or throw away any medications that they have been taking. At the same time, family members generally favor a zero risk treatment environment. They would prefer that the patient's suicidal thinking resolve completely so that there is no risk that they will attempt suicide. They see suicidal thoughts as controllable and the product of a series of correctable decisions. They don't understand why the thoughts just can't be turned off by the patient, their psychiatrist, or in some cases - the medication the patient is taking. In extreme cases, they may threaten litigation if the patient suicides or makes a suicide attempt implying a volitional and controllable basis for suicidal thinking. An understanding of human consciousness provides a way to analyze this situation and the misperceptions about suicidal thinking and behavior. The predominant model of risk assessment for both suicidal ideation and aggressive potential is risk factor analysis. It generally proceeds from an elaboration of the specific thoughts to past history of attempts, availability of lethal means, diagnostic risk factors, past history and analysis of attempts, and specific demographic risk factors associated with suicide attempts. Many texts like the Harvard Medical School Guide To Suicide Assessment and Intervention have detailed approaches to the problem and further conceptualizations like proximate and distal risk factors. In an earlier post, I discovered a checklist of risk factors that looked at the issue of Increased Reasons or Decreased Barriers to suicide called the Convergent Functional Information for Suicide Scale (CFI-S). 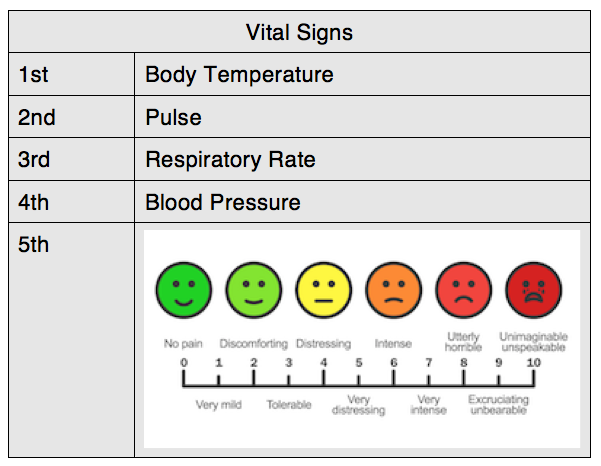 Many institutions these days prefer the Columbia Suicide Severity Rating Scale (C-SSRS). All of these methods are essentially based on risk factor analysis. Some are more elaborate than others. There all estimate risk to one degree or another and in some cases factors that mitigate risk. I won't debate the merits of these methods here. All that I want to say about them is that after the risk has been estimated, the psychiatrist may still be working with a high risk patient who is unpredictable in both an inpatient and an outpatient setting. Interventions can be initiated to reduce the risk, but there is no assurance that they will be effective fast enough to prevent a suicide attempt. In many clinics where a standardized approach like this is used with an electronic health record and a cutoff score is used to determine risk, a psychiatrist may find the patient visits being flagged for months or longer based on these numbers. Is there another model that might supplement or improve upon the risk factor analysis models? 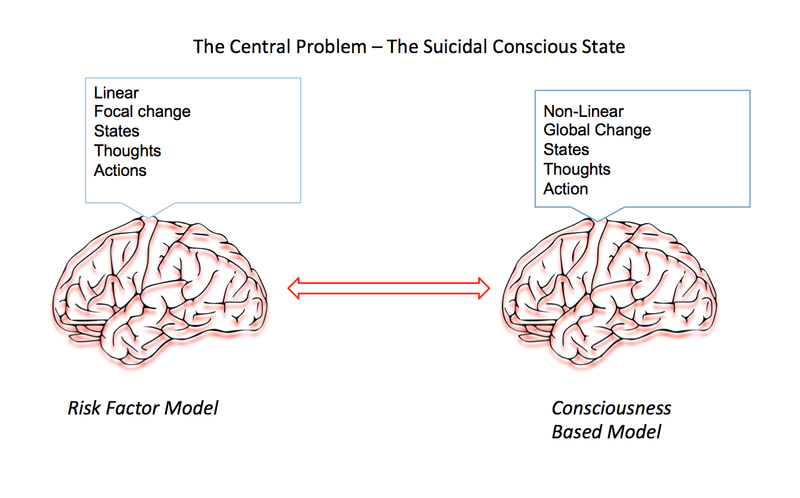 For about 15 years now, I have been looking at a model that considers the basic question of what happens when a human conscious state shifts from one that would never contemplate suicide to one that does or in the extreme state proceeds rapidly to suicide. The usual psychiatric model considers the development of an illness state like depression, bipolar disorder, borderline personality disorder, or alcoholism as a precursor state. The cognitive changes, like depressogenic thinking seen in the precursor states are seen as the basis for suicidal thinking. The intervention is generally directed at reversing the precursor state, acutely structuring the environment as necessary for safety, and direct verbal interventions to address the suicidal thinking. Of course the complexity of this situation is much greater than Bowlby can capture in his brief explanation. Just at the psychodynamic level there is the issue of identification with the parent and their suicidal actions. Do they believe that they have a deeper understanding of the parent's action and consider them to be logical? Have they incorporated this into their worldview and consider it to be their fate? At the neurobiological end of the spectrum, is it a case of straight genetic vulnerability to suicide or were there epigenetic factors related to a severe disruption of the home environment that the suicide of a parent can cause? Do they remember an event or series of events during childhood when the affected parent seemed to transmit a tendency to anxiety or depression directly to them? All of these are relevant considerations when examining what is going one at the conscious level in an individual who has become suicidal. Elementary risk factor analysis also benefits from the broader perspective of considering other conscious factors. It allows for an exploration of additional degrees of freedom. For example, the issue of firearms possession and the elaboration of risk often depends on possession and risky behavior with that gun. But what constitutes risky behavior and what needs to be asked? Have you had the gun in your hand when you were thinking about suicide? Was the gun loaded? Did you actually point the loaded gun at yourself? What were you thinking about at that time? The questions and responses cannot be anticipated in a linear risk factor analysis or algorithm. A nonlinear consciousness approach can also incorporate an informed consent approach to provide active feedback to the patient on the current risk and the limitations of treatment. This often opens a window into the dynamics of how the patient conceptualizes risk and their ability to work with the psychiatrist in minimizing it. A more linear assessment often takes on the structure of the psychiatrist trying to guess whether or not the patient is going to kill themselves and leaves the patient as a relatively passive participant. A consciousness based approach recognizes that the patient has entered at least partially into a conscious state that is foreign to them, less predictable, and represents some degree of risk to them. They need to hear very clearly that they and the psychiatrist need to work together to restore their baseline conscious state and reduce risk in the meantime. The process encourages them to not leave the interview leaving something that is potentially important - unsaid. 1: John Bowlby. Attachment and Loss - Volume III: Loss - Sadness and Depression. Basic Books. New York. Copyright by the Tavistock Institute of Human Relations. 1980, p 389. 2: Douglas G. Jacobs (ed). The Harvard Medical School Guide to Suicide Assessment and Intervention. Jossey-Bass Publishers; San Francisco. Copyright by the President and Fellows of Harvard College. 1999. I got up Sunday morning and the CNN headlines stated: "50 dead, 53 injured.....". What appears to have been a single shooter entered an Orlando nightclub last night at about 2AM and shot 92 people with an assault rifle. I saw Dr. Michael Cheatham of Orlando Regional Medical Center say that a mass casualty incident was declared and an additional 6 trauma surgeons and a pediatric trauma surgeon were brought in. The FBI is investigating it as an act of terror or a hate crime. The shooter was a 29 year old man who had been investigated by the FBI for possible ties to Islamic extremism. He had been working as a security guard for a company who provides services to the federal government. He was licensed to purchase firearms. He purchased two firearms shortly before the shooting - a Sig Sauer MCX Carbine 0.223 cal on June 4 and a Glock 19 9mm pistol on June 9 from the same gun shop. Some reports suggest he was also carrying a Walther P22 .22LR pistol, purchase date unknown. Prior to this incident the worst mass shooting incident was the Virginia Tech incident in 2007 that killed 32 people. At the time of the attack the shooter called 911 and pledged allegiance to ISIS and mentioned the Boston bombers. President Obama came on the networks at 2PM and referred to the incident: "This was an act of terror or hate." He pointed out that this was an attack on all Americans and he encouraged solidarity. In an earlier commentary (posted above) he discussed solutions. He used the example of highway traffic fatalities and how they were approached from a scientific and public health standpoint. Vehicle safety improved. Driver behaviors especially driving while intoxicated was confronted. Although he did not mention it, the drinking age in the United States was increased to age 21 largely by political leverage using federal highway money granted to individual states. He pointed out that these same public health measures cannot be used in the case of firearm violence because Congress has blocked research on firearm deaths and violence. He discussed a situation that he had just encountered, where people being tracked by the FBI for frequenting ISIL web sites could be put on the no-fly list but they could not be prohibited from purchasing firearms. That legislation is blocked by a gun lobby with a primary thesis that some members of the government want to take away Second Amendment rights and firearms from law-abiding citizens. The President points out that nothing could be further from the truth and cited the fact that more firearms have been sold during his administration that practically any other time of the Republic. I think the manufacturing statistics might back up that claim at least based on a chart I created during the first half of his administration. Further information corroborating this statement is available at the document Firearms Commerce in the United States 2015 on the ATF website. There is plenty of data there to corroborate both the President's remarks and the potential financial conflict of interest of the firearms lobby. I am sure that the gun advocates will be the first to say they deserve credit for gun commerce rather than the President. My speculation is that they would deflect the conflict of issue by either wrapping themselves in the Second Amendment or as advocates for all of the law-abiding gun owners. I think that most physicians agree with a public health approach to gun violence and would like to see more data and strategies. The existing data shows that gun availability is the single largest determinant when it comes to firearm deaths either due to suicide or homicide. It accounts for the greatest correlation with adverse outcomes from gun violence. By comparison psychiatric diagnosis does not. The President's comments on the further political aspects of gun control legislation in the US especially people being investigated by the FBI, like the perpetrator was on two occasions cannot be prohibited from obtaining firearms. That speaks directly to the pro-gun argument that all we have to do is focus on existing laws and get the guns out of the hands of the bad guys. This law potentially puts guns directly into the hands of the bad guys and nothing is being done about it. The Obama video was posted 10 days prior to the Orlando attack. I won't belabor the points I have already made in a series of posts on this blog. We are still seeing the same microanalysis and political opportunism that has become a routine part of mass shootings. We are still seeing the lack of solutions like we have seen in the past. The way it looks I can continue to post on the issue on out into the future it will probably be a problem long after I am gone. I heard a gun advocate on public radio this morning and what he said after this incident was not only depressing and disingenuous, but it typifies a rigid illogical stance that no place in science, medicine, or the 21st century. It illustrates why the gun lobby has Congress enact laws to stifle funding for epidemiological work on gun mortality and morbidity. I suppose at this point it is just a question of when we hit the tipping point. When will the majority of Americans start to reject this illogical philosophy? If the gun advocates hit the street with this hard line attitude after the scope of a mass shooting like we witnessed in Orlando - I shudder to think of what the eventual human cost is going to be. Over the years whenever I have thought of an ideal way to practice medicine ophthalmology comes to mind. I remember a good friend of mine telling me shortly before he became an ophthalmologist that the speciality seemed to have the ideal mix of medical and surgical interventions and they were mostly effective. He also had the great observation that no matter what field of medicine you specialize in - the information in that field will generally be contained in two or three large volume texts. The information always expands to that amount with specialization. My friend was a very bright guy. Like most specialties, I have had my fair share of personal contact with them starting with a BB gun injury in the 8th grade. That's right - just like in the movie - I almost shot my eye out. And just like in the movie, my father told me shortly before the accident: "Be careful with that BB gun - you will shoot your eye out!" Within minutes, I was standing there in disbelief. A BB had ricocheted off a steel lamp cover in our basement and instantaneously hit me in the left eye. Within minutes I looked in the mirror and was more shocked to discover that my iris color had been replaced with blood inside the anterior chamber of the eye. The family doctor was called and advised my parents not to bring me to their office or the emergency room, but to see the new ophthalmologist in town. He was the only physician in town who could assess and treat this injury. I spent a week in the hospital with both eyes covered and eventually recovered with a traumatic cataract in the lens of my left eye. Every ophthalmologist since has said the same thing: "You are lucky that cataract is just off your visual axis and it does not affect your vision." Even more interesting, the last ophthalmologist I saw wanted to know about my experience of seeing with a traumatic cataract just off my visual axis. In what ways did it seem different than the other eye. After many questions he finally said: "I am just trying to find out what it is like for you to have this cataract." An ophthalmologist interested in my conscious state of vision? There is still room for interpretation. No two retinas are alike. As another example, an eye doctor told me recently that prominent retinal arteries may put you at risk for glaucoma. I saw a second eye doctor 2 weeks later who agreed that I may be in the subgroup of people with prominent retinal arteries but that does not put me at higher risk for glaucoma. In 50 years of annual eye exams my intraocular pressures have always been normal. I have also used the eye exam in lectures on diagnostic accuracy looking at the issue of the diagnostic accuracy of direct ophthalmoscopy versus indirect ophthalmoscopy, basically ophthalmologists versus everyone else. The ophthalmologists win by a wide margin when it comes to detecting retinal pathology. The odds that a primary care physician can detect these changes with direct ophthalmoscopy as a screening exam are no greater than chance. In the days when I did a lot of direct physical examinations of patients, I was convinced that most physicians either did a poor job of using an ophthalmoscope or were just focusing on major landmarks. They also seemed to ignore the general clinical status of the patient. 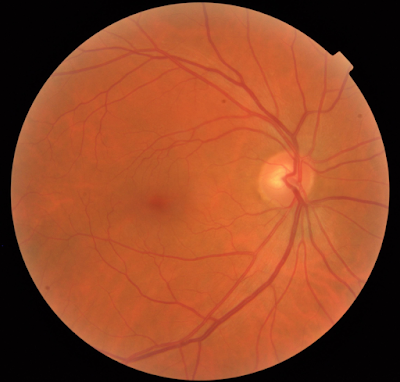 I recall an agitated, hypertensive, young stroke patient and clear hemorrhages in the retina. I diagnosed the retinal hemorrhages and nobody else did, but they could confirm when I told them where to look. Like all of medicine the subjective factor is there, even in what appear to be objective assessments, but ophthalmology seems to have some of the greatest potential accuracy and reproducibility. About 8 years ago I was interviewing a patient and looked down at the wood grain of the table. It started to swirl and move in one visual field. I was part of a big multidisciplinary clinic at the time. The information flow among the specialists was the best I have ever seen it. I called the ophthalmology clinic spoke with an ophthalmologist. After about 30 seconds of symptoms he said: "You have a retinal migraine. We can get you in this afternoon, but I doubt there is much else." I went with that advice and have had no similar problems since. A few years ago a family member called me on a Saturday morning and said he had sudden onset of veiled vision and floaters. He lives in a town of about 50,000 people. He was able to see a retinal specialist and get laser surgery on his torn retina in a matter of hours. I have had three other relatives with retinal surgery - all very successful. In my case about one month ago, I had a sudden onset of eye aching, massive floaters, and large bright halos surrounding the entire visual field of my left eye. I was triaged to ophthalmology in a few hours and diagnosed with an acute vitreous detachment with a plan to observe for any retinal damage in two weeks. Saving someone's vision needs to be at the top of anyone's list when it comes to quality of life. Surgical specialties are generally a very active intervention by physician with very good outcomes and some complications. From what I have seen the complication rates of eye procedures are very low and in some cases the advertised procedures being done are in excess of 10,000 - 100,000. In many cases there is an expectation that you will be seeing the doctor 2 or 3 times and that the chances of a good outcome that will improve your life are very high. The majority of patients seeing ophthalmologists, don't have to do much to get well. Recognize the problem, discuss the treatment plan and risks/benefits of the surgical procedure and make the follow up appointments. In the case of medical treatment - use the required eye drops, visual aids, diet, and protective equipment and participate in the monitoring plan. In the patients I see with eye problems I know that many of them do not follow up. I routinely ask about a personal history of eye trauma, visual problems, glaucoma, and macular degeneration. In some cases I call their ophthalmologist directly about whether the medication I am about to prescribe would affect their treatment. But generally an optimal path to care with a good outcome is outlined form most ophthalmology patients and the burden of adherence is relatively low. Contrast that with a patient walking into a psychiatric clinic. By that I mean a patient who gets a direct appointment with a psychiatrist. There is no precision in the assessment. There is a diagnostic manual that gives the appearance of precision, but it is fairly worthless unless the physician knows how to get at it and that generally involves having seen many patients with the problem. It also involves concluding that many DSM-5 categories are so nonspecific or unrealistic that it makes no sense to make the diagnosis. With a diagnostic manual that imprecise, markers are sorely needed and I am optimistic that we are on the verge of some. I am optimistic that with the correct markers we will be able to define categories and clearly define treatment paradigms on those categories, but I don't expect that to resemble a DSM or an RDoC for that matter. The burden of adherence is much higher. Polypharmacy and keeping all of those medications straight is certainly as big a problem in primary care and the medical specialties. Nobody else wants to see people back on an hourly basis for weeks, months, and years. One of the fastest and safest interventions in psychiatry is electroconvulsive therapy. In many parts of the country it is unavailable. The FDA has some continuous program afoot to "reclassify" it. This is the second iteration of that program since I responded to the first one years ago. The only logical conclusion is that this is some kind of political maneuver being played out in a regulatory context. My understanding is that reclassification would mean new sets of clinical trials to get FDA approval for devices. It should not be surprising that very few places offer it, and thousands of patients go through endless clinical trials of antidepressants with no remission of their symptoms. TMS (transcranial magnetic stimulation) and VNS (vagal nerve stimulation) seem far less impressive in treatment resistant populations. Just last week a colleague also pointed out that there are probably thousands of patients who might benefit from ketamine infusions and that seems to be another procedure in limbo pending FDA considerations. Without FDA approval, health insurers will deem a treatment experiment and not pay for it. That is when treatment usually grinds to a halt. Quality of life considerations should be high on any psychiatrists agenda since we learned that we treat conditions that are listed in the Top 10 of the World Health Organizations list of disabling conditions. Unless we get robust treatment responses, quality of life is not likely to improve. There are vast numbers of patients who are disabled and maintained on medications. They clearly need more than the medication but the only service offered by their health plan is a series of brief visits with a psychiatrist or a prescriber, generally focused on polypharmacy. There is no attempt at cognitive or vocational rehabilitation. Those services are available to stroke patients but not psychiatric patients. The path to getting well and recovering from a mental illness or addiction is often not clear. The message has been oversimplified to "Take your medications as prescribed." The same patient may hear "Don't do drugs or alcohol." but typically only after a problem has been identified for a while. The average person with an addiction (according to survey literature) does not disclose that to a physician. Most people after an acute episode of a mood disorder or psychosis - don't know where to start. They don't know what happened to them and they don't know how to prevent it from happening again. They may hear that they need "therapy" or "counseling" and realize that after 5 or 6 sessions, they don't like the therapist or the sessions aren't going anywhere. What is left at that point? Go back and see the prescriber in 15 minute lots about medications that seem to hardly have an effect or a seemingly endless series of medication trials? Instead of parsing words in somewhat meaningful categories we need to pick up the pace. In my experience the people who are willing to see psychiatrists for a long period of time for pharmacotherapy, psychotherapy or both are in the minority. It is clear that many psychiatrists end up seeing patients three or four times a year in what appears to be interminable treatment. All the while the patients have varying degrees of disability and problematic quality of life. All of this care is delivered by 19,216 ophthalmologists who are addressing an impressive array of eye diseases and injuries. As previously noted there are 49,070 psychiatrists also addressing a lot of illness and disease. Just like my previous argument about orthopedic surgeons, I have never heard of any shortage of ophthalmologists. Ophthalmology teaches us that there is a much better way and we should be designing those paths of care instead of the giving it over to the business people and politicians. A critical question on the idea of a shortage of psychiatrists is how much of that is due to the inefficiencies suggested above including interference from politicians and business organizations. I sprained my ankle last Friday. It was a curious experience because it is probably the first time I sprained an ankle in about 40 years. I just rolled it over coming off the bottom step of a stairway and then did the same thing at home the same day. Some pain but not bad. I was immediately able to walk on it and bear full weight on it. Over the next week it was a waxing and waning course. Still able to walk. Most of the stiffness and pain in the morning. About every other day I took a tablet of the naproxen in the morning and that seemed to alleviate the pain by evening. I went to work, at a job where I typically put in at least 10,000 steps per day on a fairly large campus. A week later it was unchanged, still painful at times and swollen. I thought I needed an x-ray to rule out a fracture. The question is - where to go? Emergency departments in my experience are the absolute slowest. I could also imagine the eye rolling when I tell them the injury is a week old. I could go to the local urgent care center, but they seem surprisingly ill equipped for most problems. I was there a few years ago for bronchitis and they shot a chest x-ray that was overpenetrated and useless for seeing infiltrates. 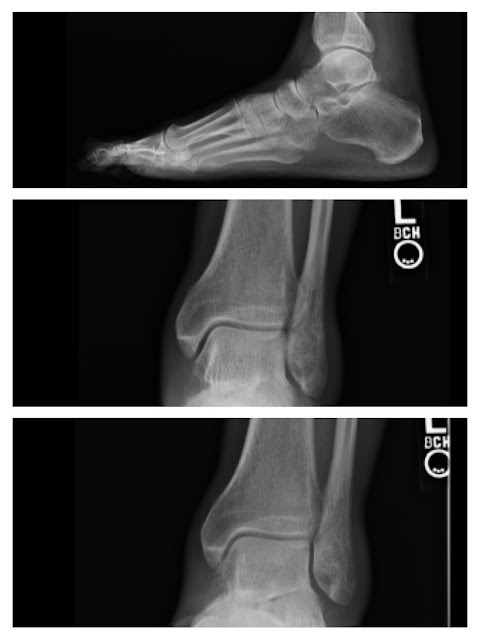 I would not have lot of confidence in their ability to shoot an ankle film with adequate technique to take an optimal look for fracture sites. I could go to my primary care clinic, but that takes phone time and half a day of PTO. All I need to know - is there a fracture, do I need to see an orthopedic surgeon, and what do I do to take care of it. The last time I had an orthopedic problem and needed to get a splint, my primary care clinic referred me to a pharmacy that had a lot of medical equipment. They did not have much in onsite to help me. Then I remembered seeing an ad for an orthopedic surgery specialty group. They had a number of new city-wide clinics. One of their features was an acute injury walk in clinic. No appointment was necessary. I had nothing to lose. The clinic lobby looked like one that you might see in a luxury hotel. There were a bank of receptionists there to get the process going. After about 10 minutes of paperwork, I was taken to an exam room by an RN who examined the ankle and took additional history. A minute later, I was off to x-ray for three views of the ankle. A minute after I got back to the room, I was examined by a physician's assistant who immediately let me know that there was no sign of a fracture. She took additional history, and did a more extensive examination of the foot and ankle. he showed me very good resolution views of the ankle on her flat screen computer monitor. She Ace wrapped the ankle gave me some care advice, two extra Ace wraps and sent me on my way. The total time of the visit was 30 minutes - 20 minutes if you don't count the time I was filling out the forms. It was all very focused and very efficient. According to the American Academy of Orthopaedic Surgeons, in 2014 here were 28,047 orthopedic surgeons in the United States. The American Association of Medical Colleges estimates 49,079 psychiatrists for comparable time period (2013) in the US. Various sources including the American Psychiatric Association release stories about the shortage of psychiatrists. I have not ever heard of a shortage of orthopedic surgeons. But what does that mean? Shortages are often measured by the ease of getting an appointment. In some cases managed care organizations are quick to point this out possibly because many psychiatrists have fled both their work environments and compensation schemes. The collaborative care models (there are several) are a work around in that patients can continue to go to their primary care clinics where there is a psychiatrist working behind the scenes - assuring that their medication therapy is rational and that their rating scale scores are trending in the right direction. As far as I can tell, the vast majority of patients in collaborative care will never see a psychiatrist. Problem solved right? 1. Not everybody needs to see a psychiatrist - The criteria for seeing a psychiatrist are very subjective based almost entirely on what the patient or the psychiatrist wants. Many private practice psychiatrists want a set period of time to do an initial evaluation and follow ups. Employed psychiatrists have to use whatever time they are allotted by the masterminds who are managing their productivity. What is the lesson from the orthopods? Triage the patient and see only the patients with the most complex problems. As long as I did not have a complex ankle fracture, I could see a PA-C and get perfectly fine care. 2. The resulting structure of the clinic benefits from that hierarchy of complexity - There were numerous exam rooms with teams of PA-Cs, nurses, and x-ray techs, screening high numbers of walk ins and treating them rapidly and efficiently. The orthopods were on site doing ambulatory surgery and following up with complex post-op and non-operative patients. There were also a number of physicians on site who were not surgeons but who focused on the medical treatment of sports injuries and spinal problems. This has immediate applicability for psychiatry. The procedures in psychiatry that create bottlenecks are electroconvulsive therapy and more recently ketamine infusions and transcranial magnetic stimulation (TMS). Shifting psychiatrists away from more routine problems would immediately create greater capacity within systems to offer that higher level of care and it could be delivered in an ambulatory setting. It could potentially provide needed treatment to thousands of people with treatment resistant problems who do not have easy access to a more intensive level of care. 3. The culture of the orthopedic clinic was the care of the orthopedic patient, greatly enhancing the efficiency and focus of that process. Orthopods don't provide collaborative care in primary care clinics and there is no broad initiative to get them there. Specialization has its benefits and in my experience all of the clinic personnel being focused on orthopedic problems was a plus. 4. The orthopedic clinic had certain expectations of social behavior - it was not explicit but you needed insurance or an ability to pay. Everyone was well behaved and nobody there was agitated or angry. That may sound elitist, but for many mental health and addiction clinics there seems like an expectation that any behavior is tolerated and if the staff has to expend considerable time and effort to deal with the complex problem of aggression or agitated and otherwise inappropriate social behavior - they should also be prepared to provide those hours of care for free. 5. The orthopedic clinic was providing care that has traditionally been done in hospitals and they were quick to point out the differences - complex care being delivered in a setting in comfortable non-hospital surroundings with staffing ratio high enough to provide the level of care that people expect. Managed care hospitals and clinics often try to manage expectations by interviewing protocols prior to giving that patient a satisfaction survey. The approach used in this clinic is to redesign the clinic and service delivery first and then see what happens on the surveys. 6. The orthopedic clinic has state-of-the-art equipment - No x-ray machines from the 1980s. I saw high resolution images a few minutes after they were taken on a computer monitor in an exam room. The contrast was excellent. I know that a lot of physicians reading this are thinking that I have lost it. Orthopedic surgery is a much more well compensated and well defined field than psychiatry. How would a group of psychiatrists attempting this model be able to pull it off financially? The biggest risk of course is managed care companies shifting most if not all financial risk to the clinic and poor reimbursement from public payers. In my opinion, a lot of that is because of the usual biases against psychiatric care, but it is also due to the lack of negotiating savvy on the part of psychiatric clinics. There is also a well known bias by managed care companies to get rid of psychiatric services or ration them either out of existence or to the point that any psychiatrist working for them is assured of providing a lot of work for free. A good place to start would be to study models like this one or radiology or anesthesiology groups and figure out what percentage of their customary fees do they negotiate for in contracting arrangements. Without that knowledge - you can't keep your doors open unless you adopt a straight fee-for-service arrangement with cash paying customers. It has been demonstrated time and time again that managed care companies shut down psychiatric clinics and reimburse so poorly that most practitioners cannot accept their patients. There are a number of arguments out there - many by other psychiatrists on whether a clinic like the one I suggest should exist. The standard argument is that it will skim off the "worried well" and not treat serious psychiatric problems. My experience in numerous clinics and hospital settings would suggest otherwise. There are many people with acute crisis situations or stress responses who end up in the emergency department where they get admitted on emergency involuntary holds. They may go to a primary care clinic where they are referred to the ED if they are perceived as having suicidal ideation or just put on antidepressants. The majority of these patients do not have a serious psychiatric disorder and need a crisis care center where they can get active treatment. In this case the "worried well" have been mishandled for decades. Another resource that is needed is a safe place to treat hypomanic or manic patients who can't function at work or at home. None of these folks likes to be housed in a hospital active day treatment with some temporary housing may be possible in a large well resourced psychiatric clinic. Psychiatry has been thoroughly fragmented by by managed care systems and governments. A large clinic like the orthopedic clinic I described, but focused on psychiatric services could potentially pull together many of the resources needed for comprehensive care and greatly improve quality. Anything moving psychiatric practice away from brief sessions focused on managing polypharmacy toward providing comprehensive services again would do the same. 1. Left ankle is my actual ankle x-ray. I occasionally post in a local political forum in Minnesota. I generally try to avoid it because politics in science is interesting at severals levels but the politics of American political parties is not nearly as interesting. The biases and political responses are always predictable. It is always a mystery to me why there are so few reasonable candidates. A few friends who have run for office and not made it on party ballots have given me their opinions, but this post is not about that. The other aspect of politics as I have stated hundreds of times on this blog is how it gets transacted in academia and professionally. The biases are again evident. In science nobody seems to take complexity into account on reproducibility issues or the unconscious biases of the researchers. In looking at conflicts of interest, nobody seems to take into account that in many cases (like the price of pharmaceuticals) that there are clearly some conflicts of interest that trump most of the others. But again, this post is about one aspect of politics and that is connectedness to the candidate. Today - I was reading my e-mails from the political forum and I came across a statement about how Barack Obama did not connect well to the middle class. I think that the research shows no matter where you end up in life, your class identification stays where you were when you grew up. That would place me solidly in the middle class - in the lower half if socioeconomic status means anything. I have seen a lot of Barack Obama and can appreciate his charisma, intelligence, ability to communicate and personality. As a small "i" independent I don't always agree with his politics, but there is no doubt that this is a guy who I can relate to and I have very high regard for. I want nothing but the best for him. 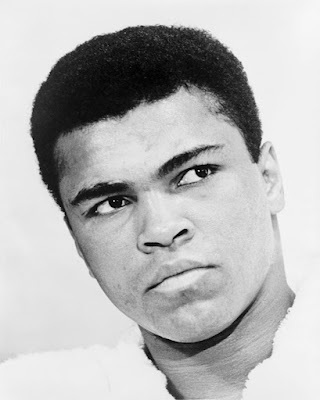 In thinking about why that might be, I reflected on another prominent American in the news this weekend - Muhammad Ali. "....Everybody falls in love with him. You can't help it. He was one good looking, lovable guy. I was excited to meet him and happy to be his friend." - CNN - June 5, 2016. I never came close to meeting Muhammad Ali. I have never attended a boxing match and even if I did, by the time I could afford it he would have been retired. My initial experience was as an early teenager in a remote outpost in northern Wisconsin. The communication in those days was primitive - just newspapers, magazines, radio and television broadcasted out from Duluth over the airwaves to your antenna. There were three television channels and on a good day - you could see two out of three. My grandfather would often say: "They've got kids running those TV stations." to describe the predicament. It was a long time before they could send a clear signal. Even in those primitive pre-Internet days, Muhammad Ali could dominate a long news cycle with his comments and the press and others reacting to those comments. There were a long series of controversies. As a young guy he was probably the most exciting sports figure to watch. He was verbose at times, articulate, and he had a great sense of humor. When he was saying something that many considered to be outrageous, he was smiling and I had the sense that he knew exactly what he was doing. He would also not back down from an argument even when he was being videotaped. No matter what he was saying, I found myself nodding in agreement with him. The other sports heroes I had at the time were shallow by comparison. No other sports figure could comment at length on American culture, religion, and philosophy. There were no other sports figures who had such an active relationship with their fans. But the most striking thing I remember, is that older generations of men did not react the same way. Most of what Ali did made them very angry. And of course at times they characterized him in very ugly racist language. Racism was rampant at the time, and it was everywhere. In rural areas, it wasn't obvious because there were no black people. My father was a railroad engineer and as a special day, he would take me to the roundhouse with him. The roundhouse was the industrial side of the railroad. All of the engines were housed in a roundhouse, just off a large turntable that allowed them to be rotated 180 degrees and connected with the main line. There was a very plain locker room with various signs encouraging adequate hygiene. In the room at the far end was an area designated for porters. I asked my father who the porters were, but I never got an answer and I never saw a porter. Passenger traffic had just about ended by then and the only thing the trains were hauling was iron ore, coal, and large bundles of scrap paper for recycling. As a 15 year old, I had to bite my tongue while the old guys in the room cheered for anyone to beat Ali or while they criticized his boxing skills or just made outrageous comments. But it was the 1960s and the culture was rapidly changing. Young people were getting louder and norms that had been in place for a generation were no longer accepted. It was easier at first to publicly agree with Ali's stand as a conscientious objector, but it soon became obvious that you were a fan of the athlete and then the man. I heard some commentators talk about the tumultuous times when Ali first grabbed the national spotlight, suggesting that had something to do with his fame. I would see it as being the other way around. A lot of young guys like me identified with him. At some level it was teenage hero worship, but unlike the other sports figures - he did not go away. He was an example of a sports legend who became a great man and on this weekend those stories abound. I found a kindred spirit where I work and we have been exchanging Ali stories, pictures, and clips for the past few years. Most of these stories are after his retirement from boxing and it is an impressive body of work. Those were my associations to the notion that Barack Obama does not connect well with the middle class. It is easy to identify with charismatic, intelligent, articulate, and empathic people. I am sure that I am not the only 15 year old that had his eyes opened to that. And I won't be the last. In 1967, I was 15 years old.